In the present, Slade Wilson reveals himself to Oliver Queen, in the guise of a businessman with an interest in Moira's mayoral campaign. Oliver must bide his time as the rest of Team Arrow gets in to position to deal with the most dangerous enemy either Oliver or Sara has ever known. Five years ago, Oliver, Sara and Slade put their plan to take The Amazo into action. With a toast of Australian rum, they hope the next dawn will see them free of the island and Anthony Ivo's madness. Green Arrow: Year One (the island sequences) and Green Arrow/Black Canary: A League Of Their Own (Roy's training in the Arrow Cave). Manu Bennett steals the show. We get to see him play Slade on multiple levels - much as Stephen Amell and Caity Lotz have with their characters in the past. We've seen hints of how the Mirakuru was driving him mad before but this episode gives us the first signs that Slade is able to put method to his madness. The charming act Slade puts on around Moira and Thea is another interesting mask, which brings to mind the classic Slade Wilson of the original Teen Titans who could be as charming as he was lethal when needed. The action sequences during the attack on The Amazo are feature-film quality. The opening credits now show Roy seeing the Arrow Cave for the first time instead of Oliver visiting Tommy Merlyn's grave. As in the comics, Oliver's full name is Oliver Jonas Queen. The sequence in which Roy is seen practicing archery in the Arrow Cave and doing badly may be a call-back to Judd Winick's final storyline on Green Arrow/Black Canary. In that story, Connor Hawke (the second Green Arrow) gained enhanced strength, durability and a healing factor following his abduction at the hands of a mad scientist but lost much of his ability to use a bow with any degree of accuracy. The Amazo is armed with GP25 grenade launchers. Slade: All I can say is you and I have something in common. Slade: I know how difficult it is to pick yourself back up when other people have written you off. Slade: Shado would be proud. Ollie: Thank you. But those trees don't move. Or shoot back. Ivo's men on the freighter will. Ollie: (testily) There's a breeze. Slade: I believe that when we lose someone we love we have the obligation to honor their memory. Ivo: It's harder than it looks, isn't it? Killing an unarmed man? Ollie: Seemed pretty easy when you murdered Shado. Ivo: I didn't murder her, Oliver. Ollie: Ivo, you shot her in the head! Ivo: I gave you a choice! You chose Sara! You blame me, but that's because you can't face your own guilt. I loaded the bullets, yes. I pulled the trigger. But you... you aimed the gun. And you hold yourself responsible, don't you? Ollie: Yes... but that doesn't mean I won't kill you. Ivo: The question is... what will he do? Ollie: Cyrus Gold. The man in the skull mask. All this was you. They worked for you. Slade: Well... I have my allies, just as you have yours. John Diggle, for example. I suppose you're wondering why he hasn't taken his head-shot? Don't worry. He's still alive. For now. Ollie: Slade.... what do you want? Slade: Five years ago, I made you a promise. Do you remember? Well I'm here to fulfill it. I'll see you around, kid. Slade: To kill you now would be a mercy. You cannot die until you have suffered the same way that I have suffered. Until you have found complete despair. And you will. I promise. Slade Wilson reveals himself to Oliver, masquerading as a businessman interested in donating to Moira's campaign. Slade brings a gift for Moira - a bottle of Australian rum - Reuther. We find out later this is the same brand that Slade used to propose a toast before the assault on The Amazo. Oliver practices sprinting, jumping, tumbling, pull-ups and running shots with his bow as part of his training regiment on the island. Sara learned enough basic chemistry under Ivo to learn how to make an antidote for truth serum. Oliver don's Shado's green hood for the first time as Slade also dons Wintergreen's mask. While speaking with Moira, Slade claims to have never been married or had children. This contradicts what Slade told Oliver about his background in The Odyssey (114), where he mentioned a son named Joe. Given all the other lies he is spinning Moira, however, it seems likely Slade was telling the truth then and that this is not a continuity error on the part of the writers. We see Anatoly Knyazev (a.k.a. The Russian) for the first time since Keep Your Enemies Closer (206) among the prisoners on the Amazo. We are also introduced to Hendrick (a violent man with a particular loathing for Sara) and Reverend Thomas Flynn - a missionary who has taken to training at least one of the rats in the ship's prison. Ivo's motivation for finding the Mirakuru has something to do with his terminally ill wife, Jessica. He left her to find a cure for her condition but judging by their brief phone conversation she is less than thrilled about his leaving her. We find out that Sara and Roy are aware of each other now and the two are seen hanging around the Arrow Cave together. Slade cuts Ivo's hand off. Slade seems honestly surprised that Sara Lance is still alive. Moira kicks Ollie out of Queen Manor, saying that he is no longer welcome in her house if how he acted around Slade Wilson is how he is going to act around her from now on. By episode's end, we discover that Slade has cameras installed all around Queen Manor, secretly planted as Thea was giving him the grand tour. Despite telling a story that has been hinted at all season that we already knew the end result of, The Promise is still an enjoyable episode that offers a number of surprises. 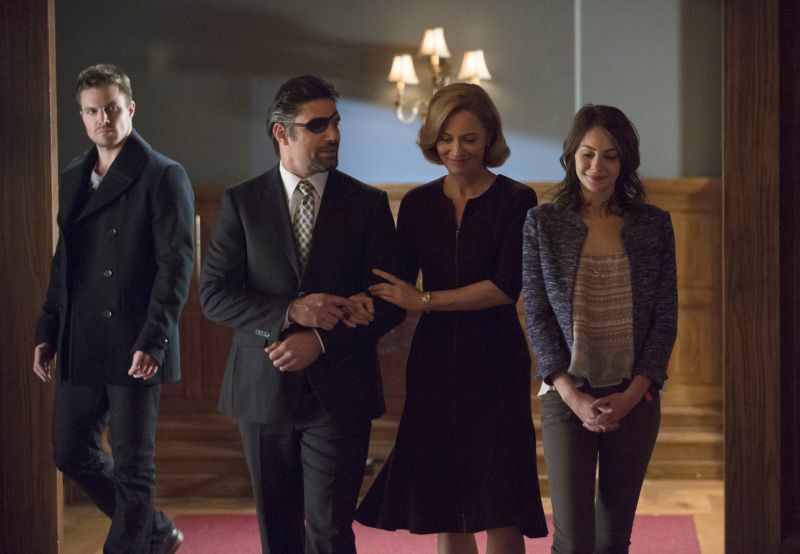 Largely set in flashback, the lion's share of the episode is focused upon Slade Wilson. Unsurprisingly, Manu Bennett proves more than capable of bearing that burden, playing Slade on multiple levels throughout the episode. The action sequences are top-notched, being perhaps the most cinematic of any the show has produced to date. All in all, a fine bit of television.